Want text alerts about emergencies and closings? For help, reply HELP to 888777. To cancel, reply STOP to 888777. No charge, but Msg & Data rates may apply. Msg freq varies. AT&T, T-Mobile®, Sprint, Verizon Wireless & most carriers supported. Support: support@nixle.com. Nixle is a communications tool used by Isothermal to communicate via email and text messages to better inform our students about campus safety alerts and warnings. We encourage all staff and students to participate. Please regularly check to ensure your preferred email and mobile phone numbers are current. Isothermal web page, and Isothermal's Facebook page. An emergency warning may be broadcasted over the tower if there is an imminent, life-threatening emergency such as a weather-related emergency issued in the close vicinity of the College, a major chemical spill, or an armed or dangerous person on campus. Listen carefully to the tower message and any Isothermal personnel’s directions. Take immediate action to ensure your safety. See “Basic Emergency Procedures” below for more information. Stay secure until an all clear message is communicated. The outdoor warning system is intended for outdoor use only; instructions from this system may not be clearly heard inside a building on Rutherford campus. Once a fire alarm sounds, evacuate and move away from the building. Remain out of the building until an all clear notification is given by campus personnel. Do not re-enter the building unless advised to do so. Never assume it is a false alarm and stay in the building. It is a violation of College safety protocol to not evacuate. In the event that there is an imminent, life-threatening emergency such as a weather related emergency in the close vicinity of one of the campus locations, a major chemical spill, or an armed or dangerous person on campus, an emergency alert message may be broadcast over the phone system. The message may describe the type of emergency and the necessary actions to be taken immediately. In the event that there is an imminent, life-threatening emergency such as a weather related emergency in the close vicinity of one of the college locations, a major chemical spill, or an armed or dangerous person on campus, an emergency alert message may be sent to those with college email accounts. The email may describe the type of emergency and the necessary actions to be taken immediately. 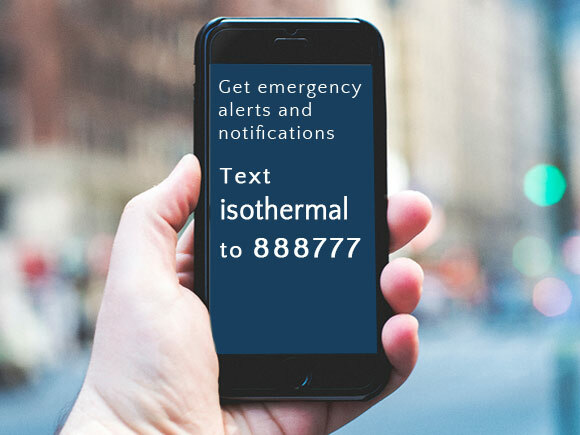 In an emergency situation, Isothermal will post safety-related announcements through the homepage of this site and Isothermal’s Facebook Page. Please remember that it may take time for authorities to investigate the situation, verify the facts, and provide the campus with instructions or updates. Use the 911 number for emergencies only. Do not call 911 or Campus Enforcement for general information. An informational message will be issued via the College website if a situation is not an emergency and does not pose an immediate threat but is of significant interest to the campus. These messages are intended to inform people of a particular situation. Examples include inclement weather notifications and important announcements regarding events critical to the operation of Isothermal. An informational message will be sent via email prior to alarm testing conducted on campus.